In this activity, students design and build a balloon-powered car for play or to compete in a performance challenge. The car design includes a custom 3D printed base, inexpensive toy wheels, and common hardware. Our Balloon Car challenge is an engaging way to practice the Engineering Design Process while learning 3D modeling on Tinkercad. The challenge can also be structured for learning physics principles such as velocity, acceleration, and traction. This project is structured to follow the Engineering Design Process (EDP), a process that helps designers in any discipline create solutions to problems. While there are many ways that people solve problems, designers often use the EDP because it offers a clear roadmap for them to follow as they work towards a solution. First, designers Define the challenge they are facing, then Learn more about the problem and Explore existing solutions. It’s tempting to skip these first few steps and head straight into brainstorming, but don’t! When designers take the time to understand the problem clearly, they come up with much better solutions. The Design phase is where brainstorming happens. Designers brainstorm multiple possible solutions, then develop a few of them into more detailed plans. Encourage your students to plan at least 3 of their potential ideas before choosing a design direction and starting to Create a product based on their design. If they hit any roadblocks trying to create their first design choice, they’ll be able to revisit their alternate design plans and choose a new direction - without starting from scratch. Designers then take time to Observe their design and see how they can Improve it. 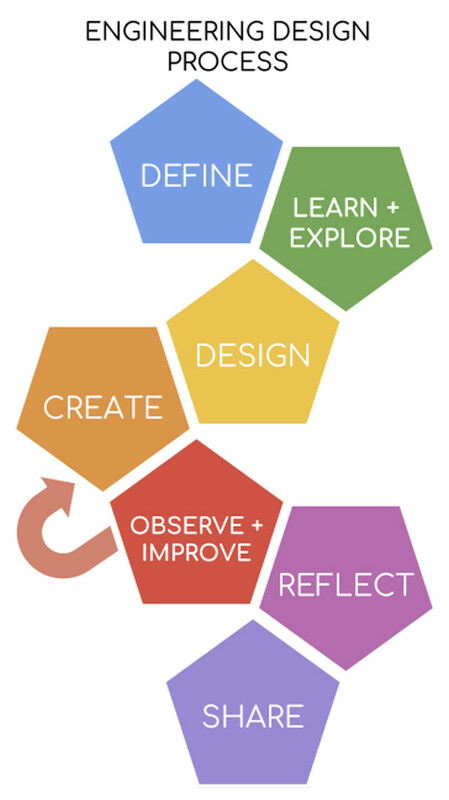 We strongly recommend that students have an opportunity for at least 2 Create-Observe-Improve cycles. When students feel they have to “get it right the first time,” they are less willing to take risks and be creative. By repeating the cycle, they have a chance to fix flaws and adopt successful ideas from classmates, and in fact, they’re practicing what professional designers really do. A good design cycle builds in time for the designer to Reflect on their product and the process of making it, looking for learning habits and insights that will help in future challenges. When the work is complete, designers are ready to Share. They bring their work into the real world, by posting, publishing, presenting, or exhibiting - or giving or selling if appropriate! - what they’ve made. For students working through a design process, a real audience helps students connect their learning and work experiences to the world outside the classroom. For Makerspaces and Maker projects, in particular, this is hugely important for building confidence in every student and a sense of community among Makers. To help students work through this process, be sure to build in planned “stops” at each step for students to record their thoughts and progress as they work through product iteration cycles. How can the Engineering Design Process be used to efficiently and effectively create a vehicle to meet a specified challenge? How can a toy balloon car be used to experimentation and understanding of physical principles? The Engineering Design Process (EDP) is a respected process for solving engineering and other critical thinking challenges. Students will learn and practice transferable skills involving creativity, communication, collaboration, critical thinking. In this activity, students work individually or in small groups to design and construct a balloon-powered vehicle that meets design criteria designated by the teacher. They use Tinkercad 3D modeling software to create a custom body that includes a base, balloon stem holder, wheel mounts and other optional features for steering, holding items, etc. This lesson gives students an opportunity to learn about common hardware items as well as technical design and construction techniques. This car is designed to use pre-fab wheels, that are inexpensive and readily available from Technical Education supply companies such as Kelvin.com. This feature reduces 3D printer time and gives the designer a real-world product to coordinate their design. The wheels are mounted to the car base with self-tapping screws which are not tightened down completely, creating a gap for the wheel hubs to roll freely. The flexible PVC tubing used as a balloon stem is another real-world product that students can incorporate in their design. Design a balloon-powered car to complete performance challenges. Student teams may consider scoring options and plan a strategy to earn points. 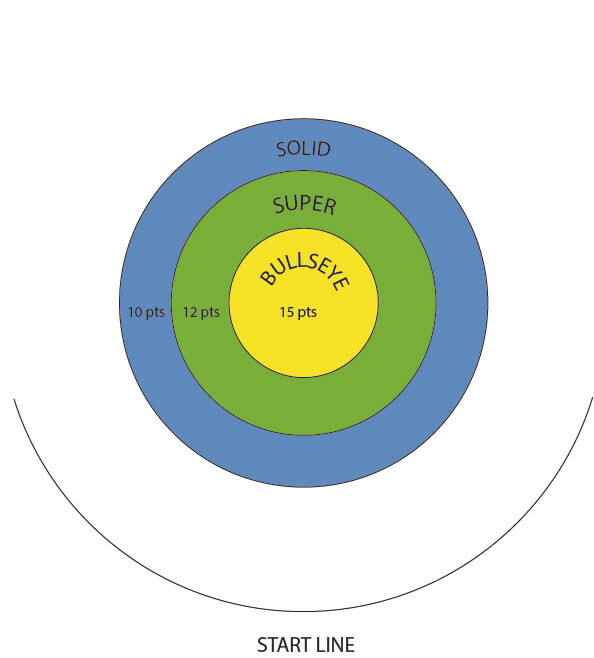 Create a target area on the floor either in a linear or bullseye fashion as shown. Cars that reach the outer limits have met the challenge while those that make it to the precise center earn extra recognition. Target features can include point zones or obstacles. Cars carry and deliver objects such as foam blocks or action figures to a designated target area in a specified amount of time. Cars that carry basic objects have met the challenge while those that carry more complex objects or get there faster earn extra recognition. The Challenges are set up so there is not 1 winner, but levels which students can try to attain, as they might in sports or martial arts. Student designers can create balloon cars that earn points in different ways, features that enhance their performance and repeatability. 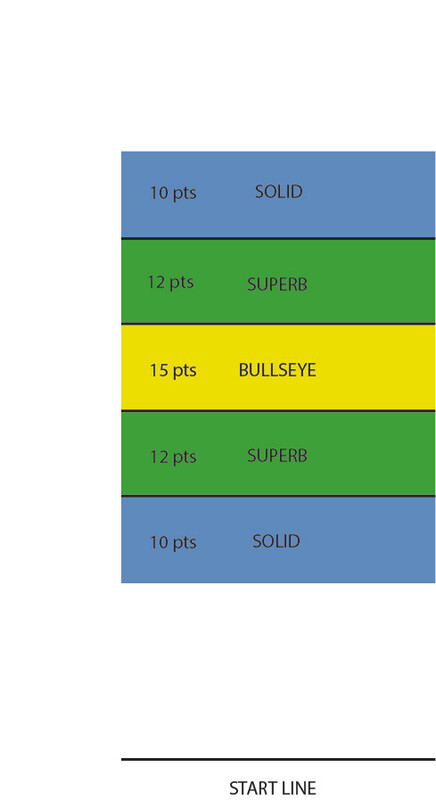 Students may be given several trials to reach the target and accumulate points. Product: Students design, build, and test a balloon-powered car. Goal: practice an iterative design process to build a vehicle that reliably carries cargo (optional) and reaches the target. Aspects of the car that will need to be designed and redesigned: car body design, wheel assembly, balloon diameter when inflated, angle to the intended path of travel when they first release the car, etc.